Want to learn how to grow grapes and have a fresh supply of grapes in your backyard? Be it due to their flavor or their health benefits, grapes are one of the most popular fruits in the world. Purple grapes specifically are juicy and sweet, making them a hit with kids. Grapes have several different health benefits due to the antioxidants as well as the antiviral and antibacterial properties they contain. They are used as laxatives in order to prevent constipation, to improve digestion. Their regular consumption can even prevent heart disease and cancer. However, in order to obtain all of their benefits, it’s best to consume good quality grapes, preferably organic ones that don’t contain pesticides or other harmful substances. In order to make sure you’re eating quality fruit, why not plant your own? It’s not hard to take care of grapes, but it all depends on the temperature of where you live. Fruit is so sensitive to its surroundings that its flavor can change according to where it was planted and how it was taken care of. 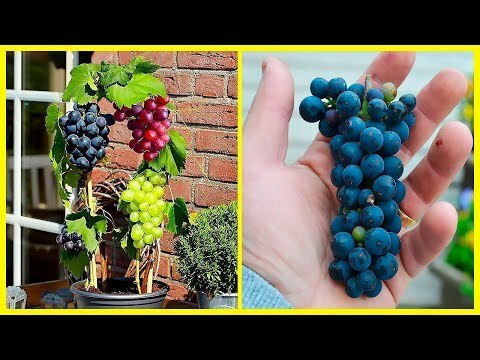 In today’s video we’re going to teach you how to plant your own grapes at home, step by step.